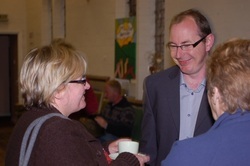 Goole Churches Together is not so much about being an organisation as being a family. 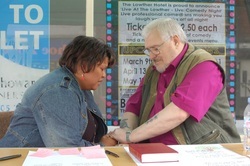 Some things are organised by the GCT Council, but much also happens informally as one church helps another. We organise a variety of joint services over the year. On Ash Wednesday, Maundy Thursday and Ascencion Day there is an evening service, each done in the style of whichever church is hosting it. Good Friday sees the Walk of Witness, when we process through the town following a cross, stopping at several points for bible readings, prayers and hymns. On Easter Day we have an early morning communion service at Lock Hill on the river bank, followed by breakfast. 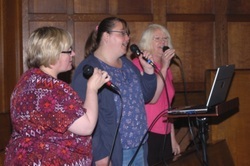 Occasionally we hold Goole Praise services, with a guest speaker and a mix of traditional and new styles of worship. There's always time for a cuppa! Whether it's over an informal cup of coffee or at one of our social events such as the quiz nights, we enjoy getting to know one another better. Once a year in spring we have a special focus on praying for Goole and each other in the Ten Days of Prayer. The idea originated from the Church of England, but locally all the churches take part.